St. Mary’s relies on the exceptional commitment of our staff members, including many who have devoted their entire careers to helping children and young adults with severe disabilities. Today, 50 employees who this year reached milestones of two, five, 10, 15, 25 or more years at St. Mary’s were recognized during a Length of Service Awards ceremony. 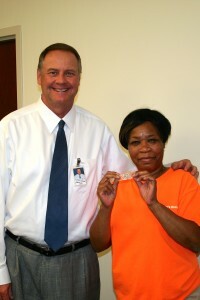 Special congratulations to Mary Byrd (seen here receiving her service pin from the CEO), a direct support professional who has been working at St. Mary’s for an amazing 40 years!